The Iranian regime has stepped up its activities against the MEK in response to its foiled terrorist attack on the annual Grand Gathering of the Iranian Resistance on June 30th in Paris. The MEK has long been a target of the regime, as revealed in the 2017 report released this week by the Federal Office for the Protection of the Constitution (BfV) in the Nordrhein-Westfalen province in Germany, which focused on the Iranian regime’s Ministry of Intelligence and Security (MOIS) and its work against the MEK and the National Council of Resistance of Iran (NCRI). The report included the regime’s attempts to infiltrate the opposition movement in Germany and added that the Quds Force is active in Germany. The terrorist Quds Force is a special unit of the regime’s Revolutionary Guards (IRGC). It independently collects intelligence abroad and engages in security and counter-espionage efforts. The BfV report specifies that the regime’s activities in the Nordrhein-Westfalen province and across Germany are primarily conducted by the MOIS and are focused on spying on the opposition, specifically the MEK and the NCRI. According to the report, the MOIS uses infiltration to spy on the opposition and then attempts to discredit them through the use of propaganda. The report added that the MOIS also uses conventional spying in political, military, economic and scientific fields. 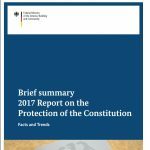 This report is cause for concern for European citizens as well as Iranian refugees. The most recent attempt at a terrorist attack by the Iranian regime was aimed at the MEK and NCRI but was set to take place among a large group of people in Paris. This planned attack was similar in scope to ISIS, with the critical difference that this act of terror was planned and implemented by the Iranian regime’s own diplomats and officials in Europe. The closure of the regime’s agencies in Europe, the expulsion of its diplomats, its agents, and the mercenaries of the MOIS and the Quds Force is urgent and necessary to protect the security of Europe and the Iranian refugees living there. The situation is dire, but the response from the European External Action Service (EEAS) has been silence. The tendency to appease the mullahs and preserve the 2015 Iran nuclear deal is strong, but it leaves Europe vulnerable to other attacks by the regime.